Unni (Karamana Janardanan Nair) is a middle-aged well-to-do landowner in the Indian state of Kerala. He lives with his sister Rajamma (Sharada), a docile woman getting well past marrying age, and a younger sister Sridevi (Jalaja), just finishing school and with a carefree, rebellious streak. 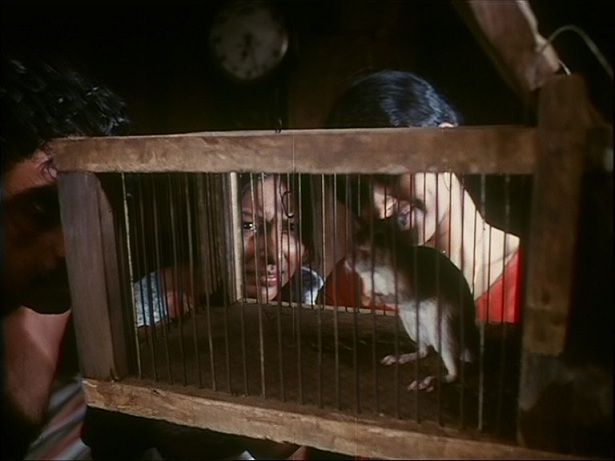 As the film opens, the three discover they have a rat in their isolated, aging estate. They trap it and Sridevi drowns it in the river. From then on, we witness a series of brief anecdotes, most of them illustrating the self-absorbed, lazy, spoiled nature of Unni and the effect he has on his sisters. Another sister, the eldest Janamma (Rajam Nair) shows up, trying to claim her share of the harvest which Unni has been stubbornly withholding… seemingly just because he can. Rajamma develops an unexplained crippling stomach ailment. Sridevi mysteriously vanishes, presumably run off with her beau, escaping the tedious household and its oppressive master. There are other signs on the world turning against Unni. The locals steal his coconuts. A cow wanders on to his land. A local woman taunts him sexually. And the rats keep showing up. Director Adoor Gopalakrishnan has been compared to Satyajit Ray, but Ray never had a film as enigmatic and free from narrative structure as this. I would say it’s closer to Ghatak, although less formally playful (although the heightened sound effects and eerie, dissonant score are there). Or perhaps Mrinal Sen. At times I thought of Weerasethakul (mysterious, quiet moments), Haneke (slow disintegration of a closed societal unit) and Buñuel (sly political satire). It is certainly one of the strangest Indian films I’ve ever seen, one that is begging to be decoded but also entrancing when appreciated on a surface level. There are highlighted items that may or may not have symbolic value… the flashlight, certainly, but what of the iron? And are the rats one of many punishments against Unni, or are the other inconveniences, impositions and tragedies some form of cosmic retribution for the first rat? At least one major theme is the feudalist treatment of women. Unni does absolutely nothing except pamper himself. He relies mostly on Rajamma to feed him, prepare his bath water, and chase away intrusive cows. The sisters are color-coded. Janamma wears green to show her as a practical person. Sridevi wears red, the color of revolt. And Rajamma wears blue, a symbol of gentleness and submission. It is she who suffers the most under Unni’s reign of the household, quietly standing by while he dismisses potential husbands for her. This entry was posted on June 4, 2012 at 9:04 pm	and is filed under Movie Reviews. You can follow any responses to this entry through the RSS 2.0 feed. You can leave a response, or trackback from your own site. Hello, firstly, I really enjoyed this write up. I would also suggest that you check out some of Shaji N. Karun’s work, especially Piravi and Vanaprastham. They also deal with life in Kerala around the same period of social change and is just as masterful as Adoor’s works. Thanks for the tip! I’ve added VANAPRASTHAM to my watchlist.